Excursion Trip for students: Exposure visit for students outside State, Science, Entertainment tours for Students, Science, Entertainment trips for Students, Science tours, Science and entertainment tours, Science excursions, Science and entertainment Trips, Picnics, Science Entertainment tours excursions/ Exposure visit for students outside State under ‘Science and Maths(RAA) project, Science Entertainment excursions/ Exposure visit Guidelines. Excursions Proceedings: In the AWP&B 2017-10 of RMSA, an amount of Rs.2000/- each per student is allotted to (5639) High Schools in the State for Exposure visit for students outside State and one school topper in IX class in the School is eligible for exposure visit to outside State. The District Educational Officers arc requested to keep the concerned the Mandal Educational Officer(MEO) as in-charge of the Exposure visit. The particulars Exposure visit guidelines as follows..
Sub: RSA, TS, Hyderabad - Excursion Trip for students "within the State" and exposure visit to 'outside State" - Extension of date 10.012018 instead of 10.01,2018 for both excursion within the State and exposure visit to outside State and revised guidelines for exposure visit to 'outside State' - Orders issued - Reg. Read: LAWP&B 2017 - 18 of RIvISA. In continuation to the Proceedings issued in the reference 2nd read above, all the District Educational Officers in the State are informed that the Guidelines have already been issued regarding conduct of Excursion & Exposure visits within and out of State and shall be completed before 10,01.2018. The Telangana State Gazzetted Headmasters Association, Hyderabad has submitted the representation vide reference 3rd cited requesting to extend the date for conduct the Excursion & Exposure visits within and out of State, as most of the schools have not conducted their exposure visits. 1. The Mandal Educational Officer/ one responsible High School Headmaster of the concerned Mandal is the In-charge of the Exposure visit outside the State. 2. The In-charge of the Exposure visit should ensure that the Exposure visit undertaken is for the benefit of students and is related to the curriculum of the course in which such students are enrolled. 3. The In-charge of the Exposure visit should ensure security i-cards to all such students and maintain a separate Data base of the personal details like guardian /local guardian, home address, mobile, e-mail etc. of such students and the same is carried by the students on his person. 4. The In-charge of the Exposure visit should ensure that written permission of one of the parents or the local guardian is submitted on the behalf of every such student wanting to participate in an educational Exposure visit. S. The in-charge of the Exposure visit should ensure that there is a senior teacher accompanying the students on such an educational EXposure Visit, if the participants are more than 15. Further, a senior lady teacher should accompany if there are girls students participating in the educational Exposure visit. 6. The In-charge of the Exposure visit should ensure that prior permission of the organisation is obtained in advance on such educational Exposure visits are under taken. 7. If the Exposure visit is undertaken to public places, dam cities, power plants, PSU's, National institutions etc. : a written communication must be made to the district Magistrate or concerned authorities. 8. If the Educational Exposure visit has more than 10 participants it is necessary to hire a local Tour operator who is well aware of the local conditions and can advise accordingly. 9. The in-charge of the Exposure visit should also clarify In the form of an undertaking is taken from every participating student that they would abide by all the Rules and also that they have submitted the permission by their parents or local guardian before they participate in the Educational Exposure visit. 1.1. Place and Institution selected for making excursion should have Educational relevance. and advance written permission of the authorities should be obtained. 13. Consent letter from the parents ensuring that the health of the participants was satisfactory should be obtained. 15, The Teacher-Student proportion should be 1:15 i.e.one teacher should be allotted for every 15 students to look after the children in all aspects during the excursion. 16.1f there are girl students, female teachers should accompany them in the proportion of 1:15. 18. Over speeding /drunken driving should be checked and traffic rules strictly followed. 19. Travelling should be fully avoided before 06.00 am and after 09.00 pm. 20. The In-charge of the Exposure visit should ensure that the students join their. guardians safely after the Exposure visit. 21. in-charge of the Exposure visit should get prior permission From District Educational Officers concerned well in advance to conduct Excursion Trip. 22. All excursion trips shall be completed before. Hence all the District Educational Officers in the State are hereby instructed to conduct the above said excursion visit within the State and Exposure visit outside the State shall be completed before 10.02.2018. Sub: RMSA, TS, Hyderabad - Exposure visit for students outside State under project on 'Science and Maths (Rashtrtya Avishkar Abhtyan(RAA)' - Release of Budget - Conduct of the Programme - Instructions issued - Reg. 1.AWP&B 2017 - 18 of RMSA. 2.Proceedings Rc.No.303/Plg.1/2014, dt.20.10.2014 of the C&DSE, TS. Hyderabad. 1. The Head of the institution should ensure that the tour undertaken is for the benefit of students and is related to the curriculum of the course in which such students are enrolled. 2. The Head of the institution should ensure security i-cards to all such students and maintain a separate data base of the personal details like guardian/ local guardian, home address, mobile, e-mail etc., of such students and the same is carried by the students on his person. 3. The Head of the institution should ensure that written permission of one the parents or the local guardian is submitted on behalf of every such student wanting to participate in an educational tour. 4. The Head of the institution should ensure that there is a senior teacher accompanying the students on such an Educational tour. Further, a senior lady teacher should accompany if there are girls students participating in the educational tour. 5. The Head of the institution should ensure that prior permission of the organization is obtained in advance on such educational tours are under taken. 6. If the tour is undertaken to public places, dam cities, power plants, PSUs, National Institutions etc., a written communication must be made to the District Magistrate or concerned authorities. 7. If the Educational tour has more than 10 participants, it is necessary to hire a local tour operator who is well aware of the local conditions and can advise accordingly. 8. The Head of the institution should ensure that an undertaking is taken from every participating student that they would abide by all the rules and also that they have submitted the permission by their parents or local guardian before they participate in educational tour. 9. The Head of the institution should also clarify in the form of an undertaking is taken from every participating students that they would abide by all the rules and also that they have submitted the permission by their parents or local guardian before they participate in the educational tour. 10. The Head of institution should also certify in the form of an undertaking that the institute will provide all necessary help in case of emergency or otherwise to all such students who are part of the educational tour. 11. Place and institution selected for making excursion should have educational relevance. 12. The peculiarities of the place and safety aspects should be looked into and advance written permission of the authorities should be obtained. 13. The school management committee/ PTA committee should discuss in advance and take a decision on the place selected for the excursion, journey programme. 14. Consent letter from the parents ensuring that the health of the participants was satisfactory should be obtained. 15. Headmasters should accompany the team. 16. The teacher-student proportion should be 1:15 i.e., one teacher should be allotted for every 15 students to look after the children in all aspects during the excursion. 17. If there are girls students female teachers should accompany them in the proportion of 1:15. 18. Only safe vehicles should be used. It is the duty and responsibility of Headmaster to ensure that the permitted number of persons is allowed to board busses or vehicles. 19. Over speeding/ drunken driving should be checked and traffic rules strictly followed. 20. Travelling should be fully avoided before 06.00 am and after 09.00 pm. 21. The Headmaster should ensure that the students joined their guardians safely after the tour. 22. Headmaster should ensure all safety precautions & take overall responsibility. 23. Headmaster should get prior permission from District Educational Officers concerned well in advance to conduct excursion trip. 24. All excursion trips shall be completed before 10.01.2018. In this connection all the District Educational Officers in the State arc requested to keep Manda] Educational Officers(MEO) of the concerned Manda! as in-charge of the Exposure visit and instruct them to follow all the safety precautions & take overall responsibility after conducting a meeting with them. Sub: School Education – Excursion Trip for students within the state under project on “Science and Maths (Rashtriya Avishkar Abhiyan) – Instructions issued – Reg. Ref: The Commissioner & Director of School Education, Ex.Officio State Project Director, RMSA TS, Hyderabad Procgs.Rc.No.1249/RMSA/TS/2017-1, dt: 24.11.2017. 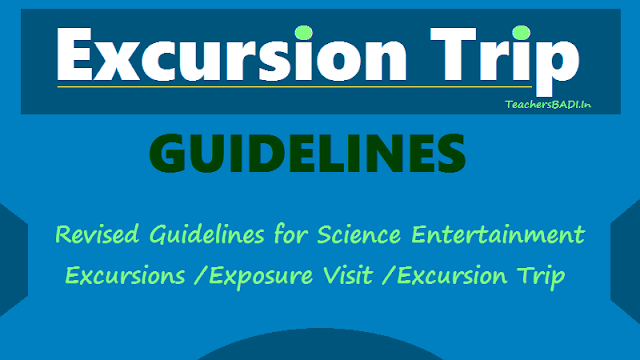 In the reference cited, the Commissioner & Director of School Education, Ex.Officio State Project Director, RMSA TS, Hyderabad has issued the following guidelines for Excursion Trip for students within the state under project on “Science and Maths (Rashtriya Avishkar Abhiyan). The Headmasters of high schools are requested to conduct the above said excursion trip within the state to the students studying in 9th and 10th classes with a strength of more than 100 students with the prior permission of the undersigned. The list of high schools communicated by the C&DSE, TS, Hyderabad having more than 100 and above 100 strength in 9th &” 10th classes is enclosed herewith.